There are still many foreign policy “experts” who refuse to credit the policies of President Ronald Reagan for the West’s victory in the Cold War. This is so despite mountains of evidence, including from former Soviet officials, and several insightful books, including Paul Kengor’s The Crusader, Peter Schweizer’s Victory and Reagan’s War, John Patrick Diggins’s Ronald Reagan, and John Lewis Gaddis’s revised and updated Strategies of Containment, that leave no doubt as to Reagan’s critical role in the fall of the Soviet Empire. 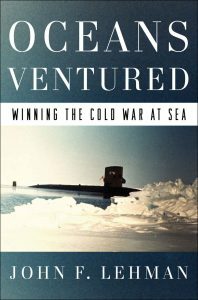 We can now add John Lehman’s new book, Oceans Ventured: Winning the Cold War at Sea, to that growing list. Lehman served as Reagan’s Navy Secretary from 1981 to 1986. He came to that position as a former Navy flier and a serious student and practitioner of geopolitics. In the author’s introductory note, Lehman informs us that he read and studied Thucydides, Gibbon, the great geopolitical thinker Nicholas Spykman, and the American sea power strategist Alfred Thayer Mahan. His faculty mentors at the undergraduate (St. Joseph’s University) and graduate (University of Pennsylvania) levels included James Dougherty, William Kinter, and the legendary Robert Strausz-Hupe. Strausz-Hupe had authored Geopolitics: The Struggle for Space and Power in 1943, founded the Foreign Policy Research Institute in 1959, and later became Reagan’s Ambassador to Turkey. After combat service on ships off the coast of Indochina in the late 1960s, Lehman was recruited to President Nixon’s National Security Council staff by deputy national security adviser Richard Allen. Soon, he was working directly for Henry Kissinger. Lehman writes that he learned from both Strausz-Hupe and Kissinger that “diplomatic power was the shadow cast by military and naval power.” It was a lesson that he remembered when he became Reagan’s Navy Secretary. Lehman watched American power decline in the wake of Watergate, our defeat in Southeast Asia, and the irresponsible policies of the Carter administration in the late 1970s. The Soviet Union engaged in a massive military build-up and went on the geopolitical offensive, and Carter initially appeared oblivious to it all. Lehman joined with concerned Democrats and Republicans (including Ronald Reagan) in forming the Committee on the Present Danger, which in Churchillian fashion warned about the growing Soviet threat and advocated a U.S. military and naval build-up to meet that threat. That Reagan set out to defeat the Soviet Union is not based on hindsight, but rather on a pre-presidential conversation where he expressly stated in simplistic but unambiguous terms that his Cold War strategy was “We win, they lose.” One of the elements of Reagan’s strategy of “peace through strength” was a six-hundred-ship navy. Lehman notes that Reagan understood that maritime superiority was essential to rebuilding American military power and winning the Cold War. Lehman was and is an unabashed disciple of Mahan and the Mahanian notion of “command of the sea.” With Reagan’s blessing, and that of Defense Secretary Caspar Weinberger, Lehman oversaw a massive naval build-up, appointed innovative and offense-minded fleet commanders, planned and conducted large and complex naval exercises, and most important, shepherded the development of a Maritime Strategy designed to place at risk important Soviet military assets. The Maritime Strategy, Lehman makes clear, was part of a multi-pronged strategy to shift from defensive containment to “rollback.” Key members of Reagan’s foreign policy team, Lehman writes, “shared a policy view that questioned the long-established defensive national strategy of containment and deterrence as being an insufficient framework to bring about a successful end to the Cold War.” In addition to the military and naval build-up, Reagan instituted economic and political policies to undermine Soviet power and confidence; to reverse the “correlation of forces” in the West’s favor. The massive, offense-oriented naval exercises of the Reagan years were the brainchild of the mostly unheralded strategists at the U.S. Naval War College in Newport, Rhode Island. Then Chief of Naval Operations Admiral Thomas Hayward established a Strategic Studies Group at the War College, which Lehman relied on to keep the Maritime Strategy “constantly evolving and incorporating the latest technology, lessons learned, and intelligence for the remainder of the Reagan administration.” These exercises had a dual purpose—to provide operational training for the fleet and to send a message to the Kremlin that our increased naval capabilities directly threatened key Soviet military installations. At one point, the Soviet General Staff advised the Kremlin’s leaders that their air and naval budgets would need to be trebled in order to defend against U.S. and Western naval power. As the decade wore on, it was clear from Soviet military writings and our intelligence sources that the Kremlin got the message. The “correlation of forces” had shifted in the West’s favor. The ailing Soviet economy (due in large part to lower oil prices) could not maintain their side of the arms race. To his credit, Soviet leader Mikhail Gorbachev recognized this and instituted reforms that unintentionally led to the unraveling of the empire in Eastern and Central Europe. Unlike past Soviet leaders, Gorbachev refused to use force to maintain the empire.